Boom Town Rocks: Instead, I wrote "Mother Nature will have Her Revenge on Old Fatty"
Instead, I wrote "Mother Nature will have Her Revenge on Old Fatty"
I was actually pretty glad that the culmination of my recent travels to the Eastern Seaboard coincided with the 2013 Western Australian State Election, because it meant I was able to volunteer to wear the Green shirt again, even if just for a few hours. Over the past couple of years I've invested a lot of my time and mind into slamming this incumbent government, so it was good to be back for the fall-out--and besides, one of my buddies was running. Anyway, the result was, from my perspective, a monstrous disaster. I make no qualms about that being my position. I was really bummed out when the news started coming through. I guess I still am. As a student of postmodern thought, it straightaway struck me that perhaps in kicking against the pricks so hard, we've created another monster. We've made him stronger. Another Howard, Nixon, Reagan, Menzies, Thatcher etc - come to life like those Simpsons billboards in that Halloween episode where Paul Anka saves the town from destruction. At the end of it all, instead of retiring to my Batcave to pour thousands of words of scorn and analysis onto this awful situation, I just wrote a song instead. 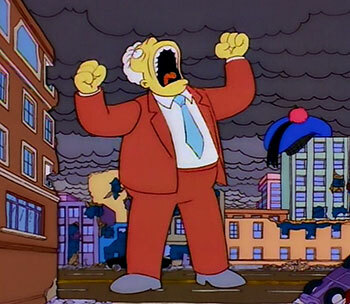 ...but Mother Nature Will Have Her Revenge On Old Fatty. Just a hollowed-out hide - hey, but at least we tried! Music & lyrics ©2013 Benny Mayhem. All Rights Reserved.